The original outfit was flirty and fun, but the bit of walking I needed to do and chilly weather had me alter the look considerably. I wore this while out on a date with my boyfriend. I am nearly always in heels for night outings, but this short frilly hemline made me feel feminine enough that I was able to enjoy a night out in comfy shoes. It’s fun to pile a bunch of gold and sparkles on top of a basic color scheme, so I busted out a cute clutch and my a few of my favorite bracelets. I heart you and I’m so glad you’re back. LOVE YOUR NEW BLOG!!!!!! You look so fab in this look! I’m so happy you’re back! :) I did get the jacket this year!!! I found it at H&M a few months ago.. it’s pretty warm and I love the length! Stunning outfit! I love the casual dolled up look. Thanks for visiting my blog! I have obviously been living in a cave. I love your new site Aline and what a fun date night outfit! 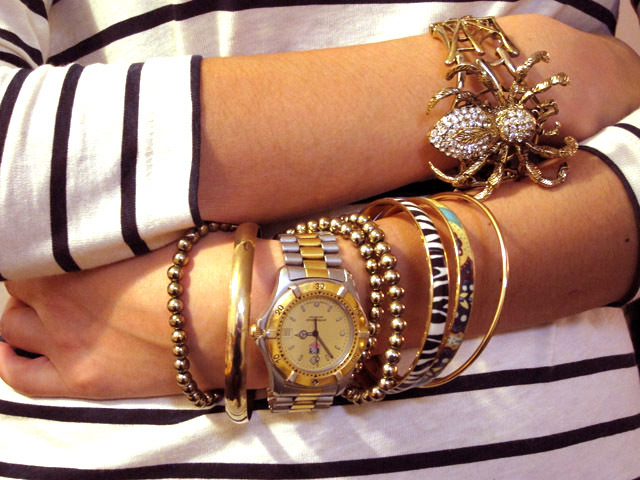 love that spider bracelot! Love the design of your blog. Can’t wait to get a chance to read(browse) more!! I really love both ways you wore this adorable dress. Those loafers are too perfect! YOU ARE BACK! this is so exciting! lovely to see you and all of your fabulousness again!!! Great outfit for date night. I like the nautical-inspired colour scheme and stripes, and those loafers are darling. You are so super adorable. I love this outfit you put together… the shoes are darling! Thanks for stopping by my blog and leaving me a comment so I could come find your cute little space here! Very pretty blog, and I love that hemline it’s such a cute length! This is such a great outfit! I am loving that dress and the coat! Where can I get that striped dress. I don’t see on the j crew website? LOVE this…the blazer coat is a perfect addition and your accessories are too cute! this outfit is so cute!!!gorgeous!!! That jacket is SO cute – and love the stripes underneath! מחפשים שירותי הדברה או הרחקת יונים מקצועים , כנסו לאתר הבית של אפקטיבי הדברות וקבלו הצעה שלא תוכלו לסרב לה .